As the nation prepares to celebrate Memorial Day, most Americans have feelings of pride in the soldiers who fought in America’s post-9/11 conflicts. But the public that will be observing the holiday is also one increasingly disconnected from the military and the wars it fought since 2001 compared to those who lived through the wars of 20th century. About nine-in-ten (91%) Americans said in a 2011 survey that they felt proud of the soldiers who have served in the military in the post-9/11 era, and 76% said they had thanked someone in the military for serving. But that appreciation comes against a backdrop of a widening military-civilian gap that was evident in a Pew Research Center survey of veterans and the general public conducted in 2011. This growing gap has roots in a watershed event: the elimination of the draft in 1973 following the contentious years of the Vietnam War. The reliance since then on a professional military and enlisted volunteers has meant that only about 0.5% of the American public has served on active duty at any given time in the period since 9/11. 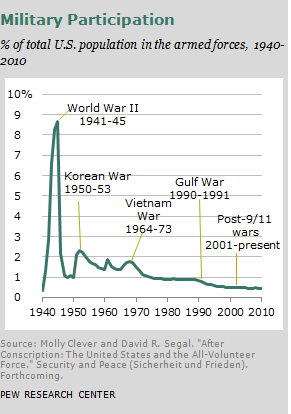 The public’s military participation was .8 % during the post-draft 1990-91 Gulf War, and its peak during the Vietnam years was 1.8%. More than 2% of Americans served in the Korean War and nearly 9% served in World War II. In addition to the substantially smaller numbers who have served, generational shifts are also resulting in loosening the connections between the general public and the military. More than three-quarters (77%) of adults 50 and over said in the 2011 survey that they had a spouse, parent, sibling or child who had served in the military. But that number falls to 57% of those ages 30 to 49, and the generation gap widens even more for the youngest adult, with just 33% of adults under 29 saying they had an immediate family member in the military. A Gallup poll conducted in 1991 found that 60% of those surveyed had either served in combat in World War II, Korea or Vietnam, or had an immediate family member who did so. One result is that half of the public said in the 2011 survey that the wars in Afghanistan and Iraq had little impact on their own lives. Another outcome is that both the military and the general public agree that Americans don’t understand military life. 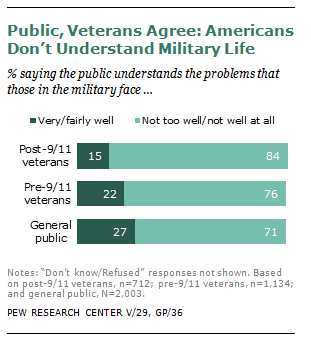 More than eight-in-ten (84%) of post-9/11 veterans say the public does not understand well or at all the problems that those in the military face. That view is shared by 76% of pre-9/11 veterans and 71% of the public. Majorities of Americans surveyed in 2011 did not think the wars in Iraq and Afghanistan were worth fighting. But even the opposition to those wars, and the gap between the military and the public, did not undermine the level of appreciation Americans expressed for the soldiers. Vietnam presented a different case. Conscription had brought the war closer to home and helped fuel widespread dissent and protests. A 1979 survey for the Veterans Administration found that 63% said the reception at home for Vietnam veterans was worse than that for veterans of earlier wars. The post-9/11 veterans served at a time when the military has become the most respected institution in the nation, according to the 2011 survey. Veterans from earlier eras are mindful of this shift in public opinion. Among veterans who served before 9/11, 70% say that the American public has more respect for those who serve in the military now than it did at the time of their own service. Bruce Drake is a Senior Editor at the Pew Research Center.